Easy-to-use employee scheduling and attendance software. Making schedules has never been so simple. It's the details, the complete experience that matter most. To create shifts, simply click-and-drag like you do on any calendar app, or copy them from previous schedules. Switch views and focus on what you care most about. Every change you make gets saved automatically. Week View. See the whole picture, make final changes before publishing the schedule. Day View. 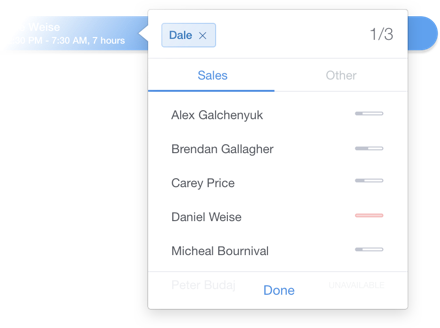 Click-and-drag scheduling with precision. Always pick the right staff, at the right time. The Scheduler knows everyone's availability and time off, which means you can always pick the most optimal staff. Avoid overtime with the visual Work Meter. In case of a conflict, get instant feedback and correct the problem easily. Now you no longer need to tell your staff when to work. 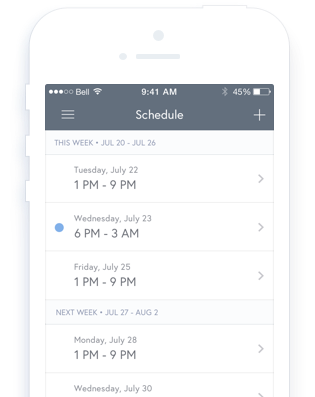 Once you publish a new schedule, your staff receives it by SMS, email and on the Schedule mobile app, instantly. They can even respond and ask for changes. Let your staff do the work. At your discretion. Your staff can update their availability information and request time off on their phone or computer. They can also drop shifts and join open shifts. All you need to do is to approve them in one centralized dashboard. Control and visualize your budget in real time. Before publishing, quickly view an estimated budget and compare with previous periods. Easily know when you're under or over staffed. If you want to know more, see detailed statistics and breakdown for each position. Setting up everything takes only a few minutes. Create an account in seconds. No credit card required. Set preferences and customize your experience. 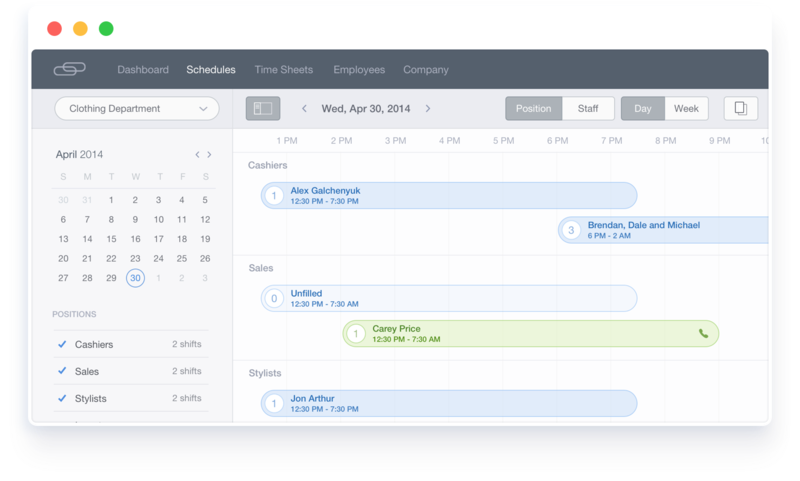 Invite your employees, start scheduling right away. 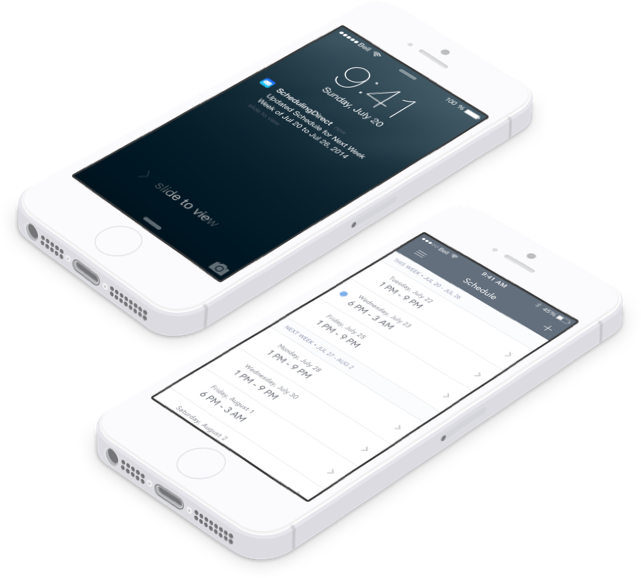 Instant SMS and email notifications. Whenever you publish a new schedule, your staff receives it instantly via email or text message. You can also choose to receive notifications for staff requests, late clock in warnings, and more. View schedule and request changes on-the-go. 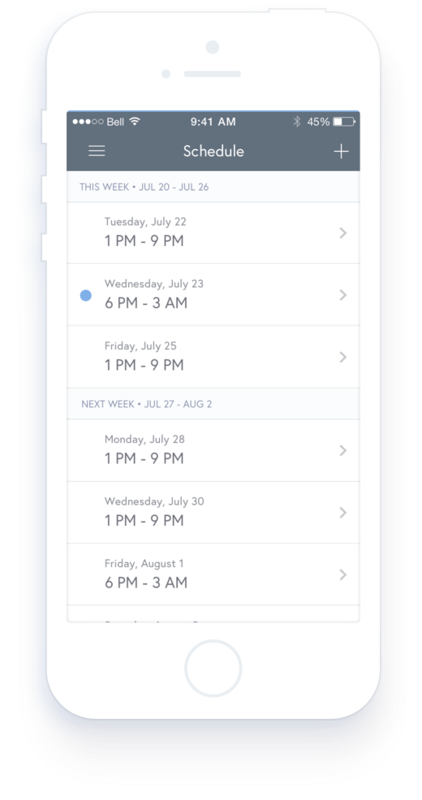 Your staff can take their schedule anywhere with the new Schedules mobile app — works in any browser, coming soon to app stores. They can also use it to edit their availability, request time offs, drop shifts and join open shifts. Leave notes as you schedule. If you left notes on a shift, your employees will see it in their schedule email and on the Schedules app. They can even see it when they clock in from Time Clock. 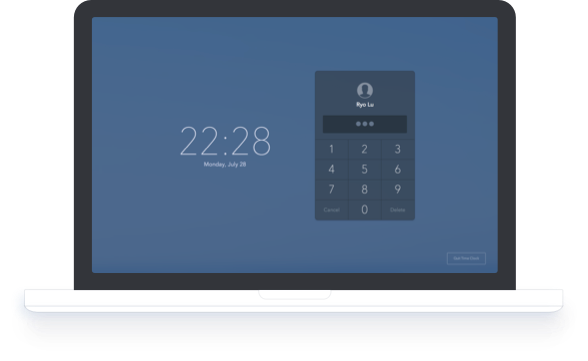 Turn any device into a Time Clock terminal. Forget expensive hardware, you can use any device you own as a Time Clock terminal. 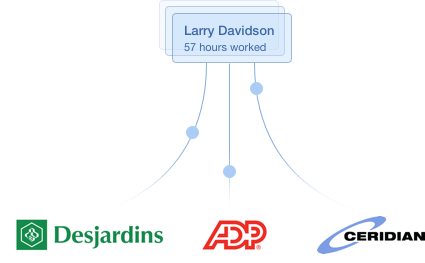 Time Clock knows your staff's schedules and will display a list of people with upcoming shifts to make clocking in really fast. It even shows the shift note if there is one. 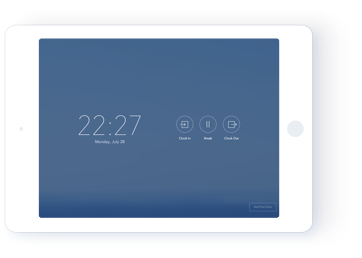 Time Sheets neatly presents clock in, clock out and break information for each staff. 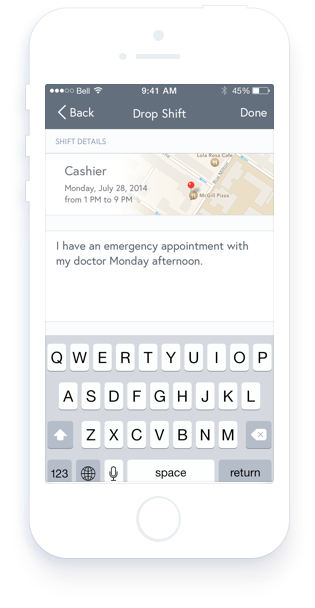 It lets you easily spot issues, such as late arrival, overtime or missed shift. You can verify, add missing data, and edit, all in one seamless flow. Issues. Spot issues and verify them before approving the time sheet. Editing. Powerful in-line editing for all data fields. Export to your payroll service of choice. If you use Time Clock, all you need to do for payroll is to approve the time sheets, and send the files to your payroll service. We will take care of generating payroll files in the correct format.